New Venice-Rome motorway + troubled A65, France. A major motorway project between Venice and Rome gets the go-ahead, while there are conflicting reports about the health of A65 in the south west of France. ITALY: transItalia ‘Or-Me’ motorway is go. In a move that is sure to be highly controversial, the long planned E45 motorway between Venice and Rome finally got the go ahead on Friday. In a short statement, CIPE – the state Inter-ministerial Committee for Economic Planning – said it had approved the ‘preliminary design requirements’ of the E45/55 Civitavecchia-Orte-Mestre motorway. The 396km road will run pretty much north-south – from the Adriatic Sea to the Tyrrenhian Sea – between Mestre (just outside Venice) to Orte (north of Rome), with an off shoot to Rome’s port, Civitavecchia. It also takes in both Ravenna and Perugia. There’s no word yet on a start date but it will cost at least €9.8bn. Opposition is already well established since the plan was first seriously mooted in 2007. The ‘Stop Or-Me’ campaign is also networked with other anti-major infrastructure organisations, notably NoTAV against the Lyon-Turin high speed rail line which has already been involved in violent clashes with police. ‘Or-Me’ is one of two major roads in progress. 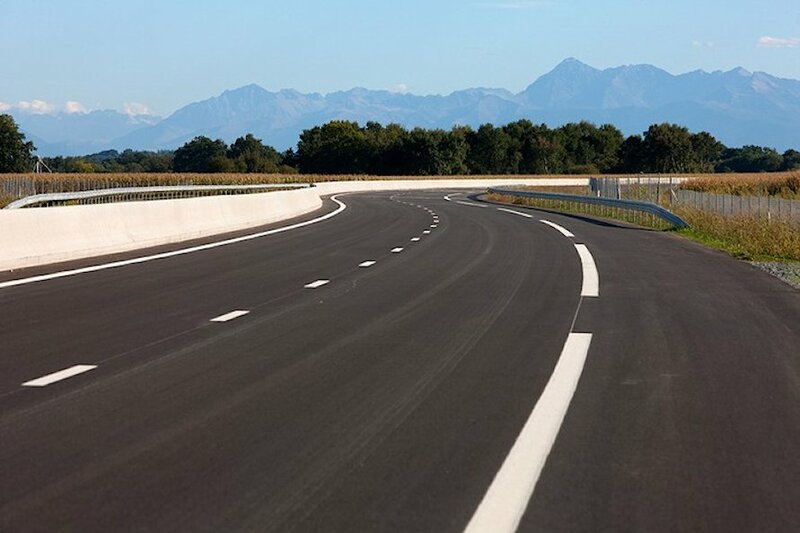 The A35 BreBeMi, between Brescia and Milan, opens next year. FRANCE: Is A65 in trouble or not? A65 southbound, heading towards Pau and the Pyrenees. As Spain’s motorways show some signs of reviving, attention switches to the normally rudely healthy autoroutes in France. The A65 – running 150km north-south between Pau and Langon near Bordeaux in the south west, opened in 2010 – is reportedly carrying 50% less traffic than originally forecast. The only French motorway built entirely from private investment, operated by A’lienor – a joint venture between major construction company Eiffage and Sanef, France’s biggest autoroute operator – the toll is €21.60 for cars and €65 for HGVs. This makes ‘Autoroute de Gascogne’ the most expensive road in France. Understandably traffic is said to be diverting to parallel Route Nationales. However, Eiffage’s latest quarterly accounts published on Friday say traffic on A65 recorded ‘another increase’ – up 5.5% for HGVs – with overall revenues growing by 11% so far this year. Whatever the truth, the prospects for A65 would undoubtedly improve dramatically with the Ecotax truck toll system, designed to encourage freight onto motorways by also tolling main roads. But, following more protests over the weekend, it is reported today that Ecotax has been postponed until next summer. Similarly, A65 would benefit from the originally-planned extension south to Oloron, setting up a direct central trans-Pyrenees route to Huesca in northern Spain. But of that there is definitely no news.